Ab2014, Abstract, ADMG-ADI-2014, Congresso Nazionale ADI, Congresso Nazionale ADMG, Pace J. Most military environmental skin disease is avoidable if field preventive medicine is rigorously practiced. Adequate preparation before embarking troops on overseas missions is the cornerstone of success, and the lack of preparation may result in a dramatic negative effect on the outcome of the military campaign. Failure can be attributed to its perceived unimportance, the immediacy of the tactical situation or lack of knowledge. The results can be disastrous. Military personnel deployed in modern wars may be exposed to a large variety of potential biological, chemical and other weapons. Extremes of climate, conditions as diverse as cutaneous infection by 'exotic' skin pathogens, contact dermatitis from protective clothing and equipment, and traumatic lesions such as callosities or blisters on the feet, provoked by marching in rough terrain, or burns acquired in battle. 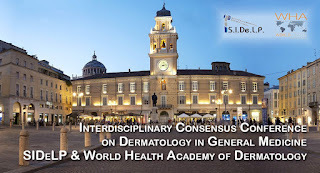 In conclusion : The military dermatologist (NOT a general physician) plays an indispensable role in implementing the necessary preventive measures, without which a significant number of personnel may be partially / fully incapacitated in the exercise of their duties..